New orders take 3-5 days for processing/printing. US orders via 1st Class Mail take 5-7 business days for shipping. US orders via Priority Mail take 2-3 business days for shipping. CANADA and INTERNATIONAL orders via USPS 1st Class International can take 5-12+ business days for shipping. Canada/International orders: Tracking is only available when the package is in the United States. We are not responsible for delays due to customs which may be a few days to a few weeks. Australia, Germany, Italy and Spain are particularly bad about holding onto packages randomly, then delivering them whenever they please. This is a small operation, so please be patient and feel free to email if you think you’ve waited too long for your order. We generally use USPS First Class Mail for single shirt orders in the US. Multi-shirt orders go by USPS Priority Mail. Almost all international orders will be sent USPS First Class Mail International. In The US shipping 1 shirt is $3.50. For multiples, each shirt is $5.50 for the first shirt and $0.75 for each additional shirt. We charge exactly what the USPS charges us plus the cost of shipping materials and a small handling fee. Canada is about $8 for one shirt and $1 for each additional shirt. International shipping is about $12 for the first shirt and $1 for each additional shirt depending on what country you live in. For all other products, go to the product page and click the “Shipping” tab under the product description. We accept payment via Paypal. If you do not already have a Paypal account, you can pay with any major credit/debit card through our Paypal gateway. If your order arrives damaged or for some reason is not the item you ordered, please email store [at] hijinksensue [dot] com and we will arrange for a replacement. REFUNDS ARE NOT OFFERED if you ordered the wrong size or the wrong style. Rather than have you pay to ship the item back, and pay a 20% restocking fee, we will happily sell you a replacement item at our cost plus shipping. In the end, it comes out to about the same cost to you, plus you get to give the shirt that didn’t fit to a friend. UNDELIVERED ITEMS: If your post office fails to delivery your item for whatever reason, we ask that you follow up with them personally to try and arrange delivery. Sometimes they will hold your item for a set amount of time, then return it to us with some reason for non-delivery. In this case, we will attempt to arrange re-delivery, but you may need to pay additional postage. “DELIVERED” MISSING ITEMS: Sometimes with apartment complexes a package will be left on top of a mailbox or at a main office, then just “magically disappear.” This usually means that the office lost it or someone stole it. We do not assume responsibility for these instances (if the tracking number says it was delivered, then neither we nor the post office are at fault), but we will work with you to get you a replacement item at our cost. 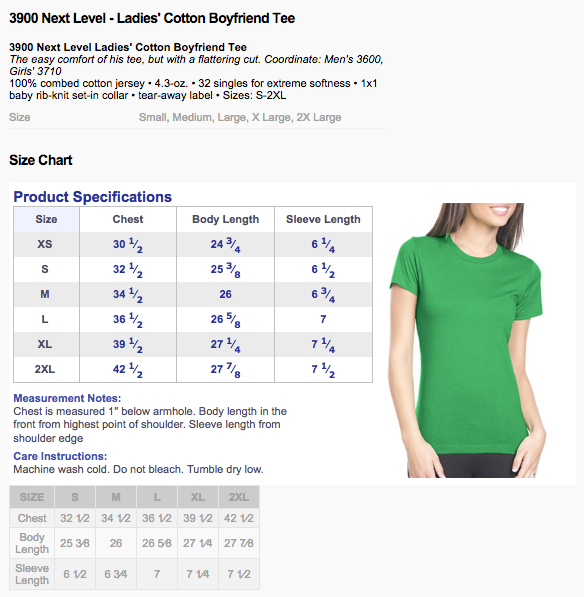 NOTE ON LADIES SHIRTS: Ladies shirt sizing is crazy. It often just doesn’t make sense. Most customers feel the ladies shirts run at least a size (if not two sizes) small (depending on how form fitting you like your shirts). 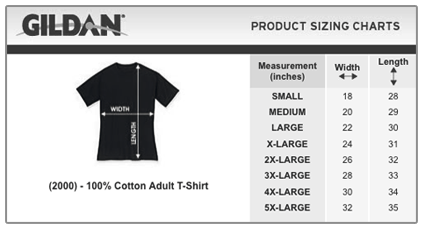 If you are tall or have a large chest, or if you are not familiar with how crazy ladies shirt sizing is, please order the men’s/unisex Gildan shirts. We use a printing method called DTG or Direct to Garment printing. This is not the cheap-0 printing method that your typical “Cafe” of “Pressed” on designs uses. It is a high quality printing process with many advantages over traditional shirt printing. Unlike traditional silk screen printing, DTG is not limited to just four colors (CMYK) — a DTG printer can produce over 16 million colors. DTG can print graphics with up to 2880 dpi. Traditional silk screen printing is limited to approximately 72 dpi. Garments printed using DTG technology have excellent washability because the ink actually penetrates into the fabric. Unlike silk screen and heat transfers, the printed image will not crack or peel off after a few washes. The final print is very soft and not shiny or plastic looking like a lot of silk screened shirts are. The ink appears to be part of the shirt. It’s pretty neat. FYI: With traditional silk screen printing the designer has to order large quantities in bulk in order to make any profit on the shirts. With DTG printing I can order 1 or 1000 and it’s the same price. This means I don’t have to do extended preorders or wait months before shipping your order. Learn how to wash clothes! Call your mom. She can probably tell you how to do it. Wash your t-shirts inside out. Wash in cold water. They will still get clean. I promise. For the best results and longest color life, hang to dry instead of using a dryer. If they are wrinkled afterward you can tumble them in the dryer on low or no heat for a few minutes.